that tiny photographer: BOMBS! do damage with FIRE! BOMBS! do damage with FIRE! Julian brought home a science project folder. Week one we were asked to write down five questions our little scientists had about the world around them. Knowing me this happened at 6:30 on a Tuesday evening...no 7:30...when Julian's homework is due on Wednesday morning. He came up with these five questions and I didn't edit him. How do you make a chemical? The folder demanded of us the next week to narrow the four questions down to two main interests. Again, I didn't edit Julian, and he choose bananas and bombs. We came up with several questions for each. I assumed we would do a research project, and I was fully prepared to force him to do it on bananas. We would look up information to answer where bananas grow and why they are called bananas. BUT...the next week we were asked to plan an experiment with a question and a hypothesis. I felt stumped on how to turn his banana questions into an experiment. I thought about starting from scratch, but I typed in "easy bomb experiments". I found directions for a super easy "Plastic bag bomb" that made Julian really excited and totally seemed safe. All was settled until I got a yellow sticky note on Julian's Friday folder from his teacher asking us to talk about testing "bombs". I hadn't really considered that he would be presenting this to a classroom of kindergartners He came home with a sample script for his presentation. I started to laugh when I inserted what his responses would be. So we kept the experiment, but dumped the word BOMBS! and called it a chemical reaction instead. Looking back at his initial questions, he did ask about chemicals! And for your information, the bomb was a little lackluster. The bag did pop and it did make Julian jump, but the water stayed in the bag and just a small hole was created to let the carbon dioxide escape. We were certainly NOT thrown against the side of the cabinet from the force of it all. So, I would recommend it to all you super cool, slightly oblivious parents such as myself. 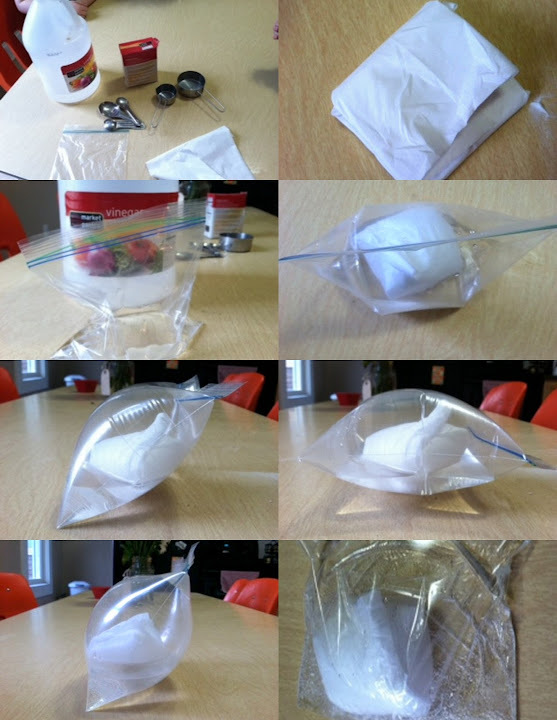 Here are the instructions http://www.wikihow.com/Make-a-Sandwich-Bag-Bomb. about bombs. Add white phosphorus to an explosion and it will set anything on fire. I'm doing a little work here and there. This baby is still cooking. I love being Aunt Mel.